1. Insert the lock body into the lock hole on the door side, and tighten the two self-tapping screws. 2. Screw the two fixing screws and fixing bolts on the outer plate. 3. Align the two bolts on the outer panel assembly with the pre-drilled holes on the door panel and install the outer panel assembly. 4. Install the inner panel components, gently tighten the two fastening screws, pay attention to adjust the position so that the handle hole, keyhole, square keyhole and keyhole on the panel are coaxial. 5. Insert the lock into the lock hole on the inner panel and insert the locking screw into the hole in the lock panel. Align the locking screw hole and tighten. 6. Insert the square chute in the same direction as the handle fixing screw into the square hole of the lock body. 7. Mount the external handle. 8. After tightening the fastening screws on the inner panel, tighten the fastening screws on the handle. 9. Install the lock box and lock plate, tighten the screws. 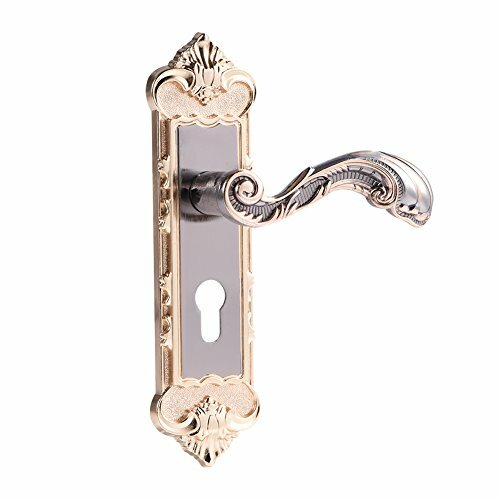 Quality door lever ideal for home, office, hotel, gate, bedroom, bathroom, also as a prefect gift for your friends, etc. Pull Push 70 inches Handles for Entrance Entry Front Door, Interior and Exterior, Satin Finish, Storefront Door, Commercial Entry Gate and Office Door, Modern and Decent Design Rectangle Style.